The Nike Tech Essentials Web Belt fits all waists up to 42 inches and has a metal military buckle with a bottle opener on the back of the buckle. If solids aren't your style, take a look at the Tommy Hilfiger Reversible Khaki Canvas Belt with a green and blue ribbon overlay down the center. This belt goes well with either cotton chinos or denim. The belt, which reverses to solid blue canvas, has a twist-and-pull reversible silver-finish buckle, a brown leather tab with the "Hilfiger" imprint and a matching leather keeper. The Belt Shoppe also has Tommy Hilfiger stretch web belts and stretch woven canvas belts from which to choose. Sometimes black and brown belts just don’t cut it! Try a White Canvas Belt or a Black Web Belt to complement your attire and add some pizzazz to your personality. 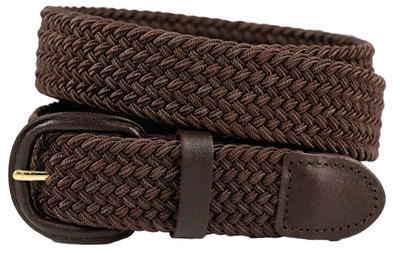 We have men’s canvas belts in a number of colors. Choose your web belts and buckles in a multitude of colors! Looking for belts that go well with jeans and khakis? Look no further than out canvas belts collection. These tough, sporty fabric belts should be a part of every man’s wardrobe! Webbed belts are colorful, adjustable and flexible, which is why they're so popular. You can find a full line of men's web belts and canvas belts by several national designers at The Belt Shoppe.